These 120 inspirational quotes were created by our designers and are totally unique to us - meaning you won't find them anywhere else. They are printable so that you may hang them on your wall - and we also give you ideas for lots of other uses. 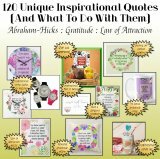 These 40 Abraham-Hicks digital quotes are not only G-O-R-G-E-O-U-S, they're also printable quotes that you can hang on your wall. 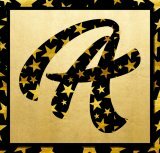 We have them in frames, on our computers and even on our tablets, phones and the screens in our cars! If gratitude is important to you - and it should be IF you want to change your life - then this inspirational quote is important. 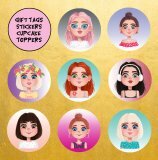 These 8 adorable young women gift tags, stickers and cupcake toppers are so, so useful - especially for parties. These 16 steampunk stamps are approximately 2" x 2.5" and can be used in a myriad of ways. 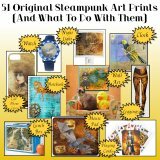 If you love steampunk, you will love these incredible steampunk prints! They're available here on BlissPlan already printed, but you can print them yourself and get 4 for less than the cost of just one already-printed. These 96 printable polka dot gift tags, stickers, bookmarks and cupcake toppers are a great DIY project and are perfect for dozens of uses! With 1805 printable gift tags you will never have to buy gift tags again! How cool is that? What an incredible deal! 51 high resolution, 8" x 10" prints that you can print and hang on your wall. This spectacular watercolor print of six arctic animals in the snow is one of the most beautiful pieces we've ever seen.